WTI declined to near $53.50 as investors continue to react to Monday's U.S. government report that showed a decline in factory orders raising concerns over future demand. Low liquidity could also be weighing on prices due to the start of the Asian Lunar New Year. 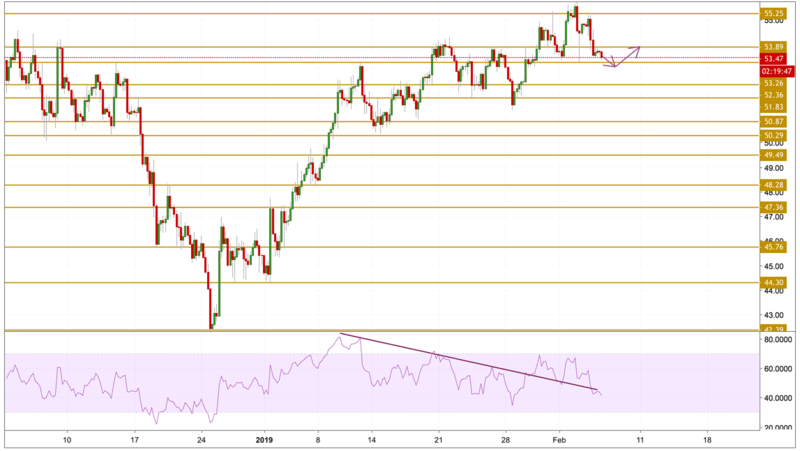 Later today, investors will get the opportunity to react to the latest weekly inventories data from the American Petroleum Institute (API). Crude oil prices declined as expected, breaking below the $53.89 level after printing new highs two days ago. The price is currently above the $53.26 support level but continue to edge lower as the momentum is loosing ground. We expect the price to test near support levels and the we will be focusing on the $53.89 level.